Thisis the week that the famous Leonid meteor shower will be reaching its peak, andthe best viewing of these ultra-swift "shooting stars" should come beforedawn on Wednesday and Thursday (Nov. 17 and 18).? Thereis always some uncertainty in the number of meteors the Leonid shower willproduce, but the best consensus from most meteor experts indicates that thisyear viewers should expect to see approximately15 to 20 meteors per hour if theyhave clear skies. Awaxing gibbous moon will set about 1 1/2 to 2 1/2 hours before dawn, andtherefore should not hinder the viewing for prospective meteor watchers duringthat time frame. 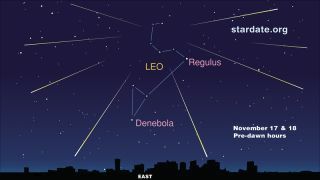 Leonid meteors appear to fan out from the constellation Leo,the Lion. This sky map shows where to look to see the Leonid meteorshower this week. If you have alawn chair that reclines, use it during your searchfor Leonid meteors since it will help keep your neck from getting stiff aswell as make it easier to look at the night sky. And rememberthat for most parts of the country, November nights can be quite cold ? moreapropos for a hot bath as opposed to a meteor shower. So take along someblankets or better yet, a sleeping bag, as well as a thermos of hot tea orcoffee with you.? It?s alwaysmore fun if you have someone watching with you (or if you're watching with agroup of people) ? so try "showering" with a friend. Let your eyes relax and don't worry about looking in anyone specific spot. Relaxedeyes will pick up on any movement and will help you spot more meteors this way.And you don't need binoculars or a telescope for watching a meteor shower. Infact, using one makes it far less likely for you to see any meteors at all becauseit considerably reduces the amount of sky you can see at any one time. Onthe other hand, the Leonids are known for occasionally producing outstandinglybright meteors known as fireballs ? brilliant meteors that explode in a fieryflash called bolides. Either of these kinds of meteors is capable ofleaving an incandescent streak or trail behind it that can linger for manyseconds, or even minutes. If you have binoculars, you can use them to geta close-up view of a luminous trail and watch as high altitude winds bendand distort it as it gradually fades from view. Watching ameteor shower consists of lying back, looking up at the sky ? and waiting. Ifthey're indeed active on the mornings of Nov. 17 and 18, the Leonids willproduce ? on average ? a meteor sighting about every four or five minutes undera dark country sky. Any lightpollution or obstructions like tall trees or buildings will reduce the countconsiderably. By these standards, the 2010 Leonids will pale in comparison tothe performances in the early part of this decade, yet possibly will becomparable to the October Orionids, which are usually categorized as a"good" display. A Leonid isone whose path, if traced backward across the sky, intersects a spot inside thecurve of stars that marks the "blade" of the Sickle of Leo. TheSickle begins rising out of the east-northeast sky after about 11 p.m. localstandard time and is poised high in the south as dawn begins to break.? Atapproximately 33-year intervals, when Comet Tempel-Tuttle comes closest to thesun in its orbit, (a point called perihelion), it sheds a significant amount ofmaterial. This creates knots of material along its orbit. When Earth passesthrough one of these knots, viewers might possibly see hundreds or eventhousands of meteors per hour at the shower's peak. Justsuch a circumstance occurred after Tempel-Tuttle passed perihelion in 1998.Between 1999 and 2002, Earth passed through several knots of material and wewere treated to spectacular storms of Leonid meteors. Butif Earth simply passes through the normal section of the comet's debris trail,the number of meteors visible will be much lower. That type of condition is ontap for this week. The Earth will not encounter any dusty knots of comet debris,but instead will pass through a region of particles that are evenly distributedand fairly far apart.? Meteorastronomer, Jeremie Vaubaillon of the Institut de Mecanique Celeste et de Calcul desEphemerides in France, has mapped Earth's path through this year's Leonidstream. Vaubaillon'smap shows that Earth willinteract with particles from Nov. 8 to 24, but the greatest concentration ofparticles will be encountered between Nov.17 and 18. Aftermidnight, the only meteoroids escaping collision are those ahead of the Earthand moving in the same direction with velocities exceeding 18.5 miles persecond (30 kilometers per second). All others we will either overtake or meethead-on. But beforemidnight, when we are on the back side, the only meteoroids we encounter arethose with velocities high enough to overtake the Earth. Therefore, on average,morning meteors appear brighter and faster than those we see in the evening.? And becausethe Leonids are moving along in their orbit around the sun in a directionopposite to that of Earth, they slam into our atmosphere nearly head-on,resulting in the fastest meteor velocities possible: 45 miles per second (72 kps). ?Such speeds tend to produce bright meteors, which leave those aforementioned long-lastingstreaks or trains in their wake. Also, as Leo is beginningto climb the eastern sky near and before midnight, there is a small chance ofperhaps catching sight of an "Earth-grazing" meteor. Earth-grazers are long,bright shooting stars that streak overhead from near to even just below thehorizon. Earth-grazers are distinctive because they follow a path nearly parallelto our atmosphere. On Nov. 16 and 17 at around11 p.m. and in the hour or two thereafter ? as the Sickle of Leo rises ? is thetime with the most promise of seeing an "Earth-grazer." A significant drawback tothis year's Leonid display will be a bright waxing gibbous moon that late onthe evenings of Nov. 16 and 17 will be located against the dim stars of theconstellation Pisces, the Fishes. It will light up the sky onthese nights and almost certainly will squelch any of the fainter streaks thatmight otherwise be seen. But in the after-midnight hours, the moon will be headingdown into the western sky, ultimately setting at around 2:45 a.m. local time inthe predawn hours of Nov. 17 and 3:45 a.m. on Nov. 18. From the time of moonset,until around 5:15 a.m. ? when the first streaks of dawn begin to appear in theeast ? the sky will be dark and moonless. That interval will provide you withyour best opportunity to see any Leonid meteors.? Joe Raoserves as an instructor and guest lecturer at New York's Hayden Planetarium. Hewrites about astronomy for The New York Times and other publications, and he isalso an on-camera meteorologist for News 12 Westchester, N.Y.